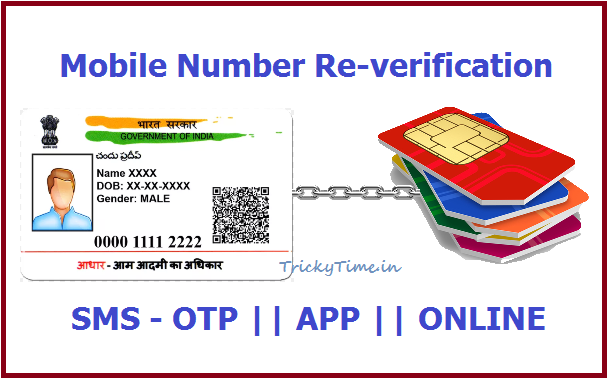 How to Link Aadhaar with Mobile Number through IVRS Call or SMS? (Live) How to Link Aadhaar with Mobile Number at Home through IVRS Call or SMS? How to Link Aadhaar Card with Mobile Number Online through App or IRIS or SMS? – So you might be aware that Linking Aadhaar Card or Aadhaar Number with Mobile Number is now compulsory. This is applicable to each and every Indian Customer who are using Indian Telecom Operator Services. We already posted How to Link Aadhaar Card to Mobile Number Online or Offline? but many people faced issues because of lack of Offline Retailers or Agents doing this and even sometimes the fingerprints weren’t matching. So to avoid such problems and to facilitate this task, Government came up with three new methods which are now currently in action. Last Date to Link Aadhaar with Mobile Number is extended to 31st March 2018 and New Method “Re-verification through Call & OTP SMS” is Live Now! Video Guide Added below! In this Article, we will guide you on How to Link Aadhaar Card with Mobile Number Online through App or SMS i.e., OTP or through IRIS Scan System. So read the full guide very carefully. Since many aged people faced issues in visiting offline retailers and getting the re-verification done, now these new methods facilitate the re-verification process. Sitting at home, through Mobile Phone, one can easily Link their Aadhaar with their Active SIM Cards or Mobile Numbers. We will see How to do so in this article. Easily link Aaadhaar card with Mobile Number Online from App or through SMS or through call sitting at home. No need to do fingerprint verification. No need to visit any retailer or agent and give your Information such as Aadhaar Card and it’s linked data. No need to pay any fees, it’s free, easy and instant. It’s necessary that your Aadhaar Card should have any linked or registered mobile number. This is for receiving OTP when you do re-verification using new methods. 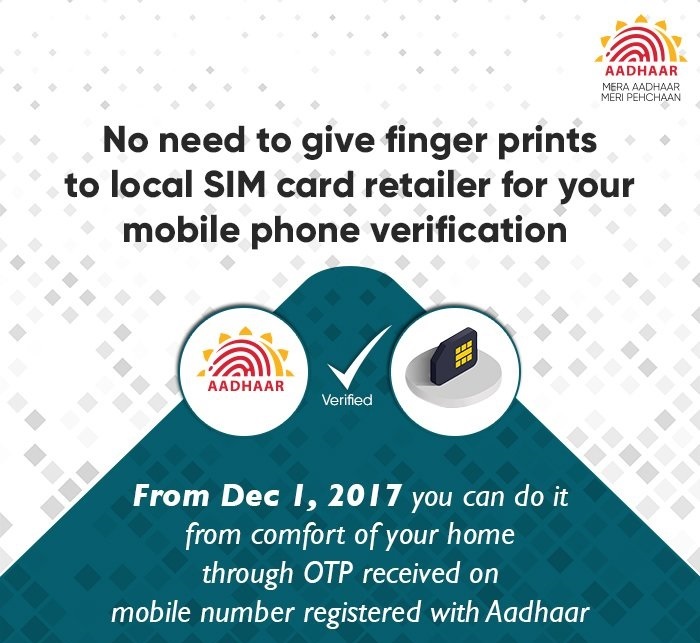 You will receive OTP on your Mobile Number registered with your Aadhaar Card. If you haven’t yet registered or linked Mobile Number to Aadhaar Card then read this: How to Change Mobile Number in Aadhaar Card Online? ALSO CHECK: How to Port Out from Aircel to Any Other Network Using UPC Method? 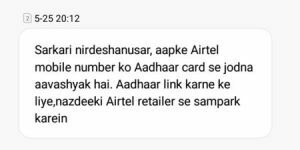 NOTE: For all the Operators or SIM Cards, the “Aadhaar SIM Linking through Call” Process is Same and Common. So you can use the same guide to Link Aadhaar Card with any Indian Mobile Number. 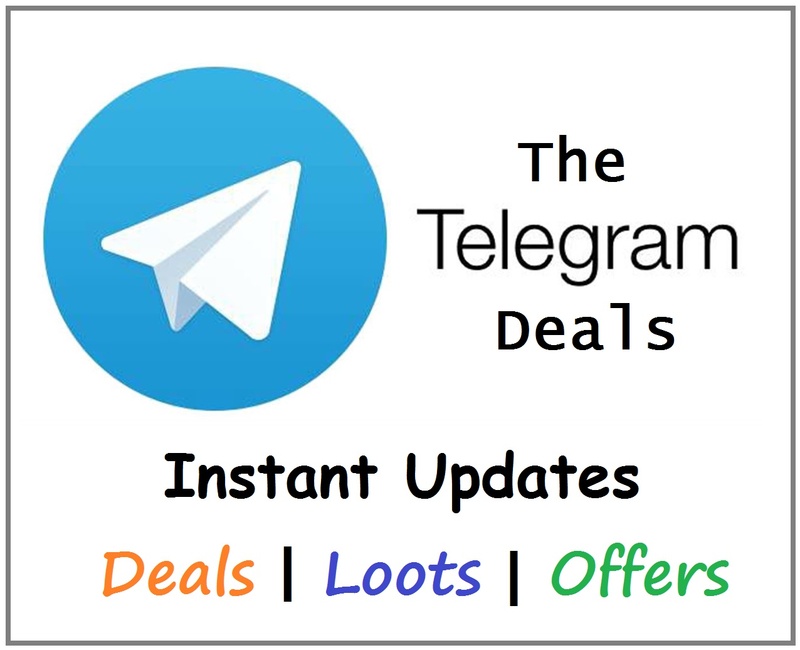 You can do Idea Aadhar Update, Vodafone Aadhar Update, Airtel Aadhar Update, etc. right through the given guide. Step – 1: First of all, Open Phone Dialer and Call to the given Toll-Free IVRS number from the Mobile Number which you want to Re-verify. Step – 4: Wait for a Beep and then enter your 12 Digit Aadhaar Card Number through Dailer Pad. To confirm the Aadhaar Card number you entered, Press 1 key again. Step – 5: Your Aadhaar Card Registered Mobile Number will receive an SMS containing OTP of 6 Digits from Aadhaar Portal. Just check the OTP, and wait for the Beep and then enter the OTP on the Call itself through Dialer Pad. Step – 6: Then again confirm the OTP by Pressing 1. Upon successful OTP Verification, the Re-verification Process completes. This is it. You will soon receive Confirmation SMS on the Status of your Aadhaar Card Mobile Number Linking. How to Link Aadhaar Card with Mobile Number to Continue Services? Step – 1: Your Network or Operator (Idea, Vodafone, Airtel, Jio, etc.) will provide you with the UID Recipient Number. Just Send Aadhaar Card Number using SMS on UID Number from your Mobile Number which you want to Re-verify. Step – 2: Your Network or Operator will do the Demographic Verification of the Number and the will send the OTP request to UIDAI Portal. You will receive an OTP on your Mobile Number from UIDAI. Step – 4: Yahoo! That’s it. Your Re-verification is Done! Your Aadhaar Card is now linked to your Mobile Number. Follow the same steps for all your Mobile Number’s Re-verification. The Last Date to Link Aadhar Card with Mobile Number is extended to 31st March 2018. What are the methods available to Link Aadhaar Card with Mobile Number? There are several methods available, few of them are common and few are new. What can I do if I am currently Outstation. Using newly introduced methods, you can now Link Aadhaar Card with any circle Mobile Number from anywhere until the time you have access to the Aadhaar Registered Phone Number. I have a Docomo SIM from Jharkhand, now using at Kolkata. While dialing 14546 for linking Aadhar from this number,I am getting reply that dialed number is not valid. What can be done further ? Thanks for the comment. Well, there might be some issue from UIDAI due to which you receive OTP after sometime but this is working fine with other operators. Let’s wait for Government to come up with more better and easy options. I have adhar card from Andhra Pradesh, SIM from Maharashtra, and I am working in GUjrat. I tried OTP method several times but every time it failed (It appears it is for local mobile with local SIM, means same state mobile and sam state SIM only). Can you you guide further. After sending OTP for final verification to the service provider it says try next time. What shall I do? OTP SMS would arrive on the Mobile Number registered with your Aadhaar Card. Re verification through this no is not available.. I have not received any UID till date. What can I do sir,..
New IVRS Call method is added, check that out. You can also watch the video tutorial added here to make sure you are following the guide correctly and completely. Check out the video tutorial added here to make sure you are following the guide correctly and completely. OTP comes on Aadhaar Registered Mobile Number. So make sure you have registered a mobile number to your Aadhaar Card, if not then visit nearest Aadhaar Kendra and do so. It’s not working in roaming with my airtel number. What error message do you hear or get? It says dial again with 0, when I dial again 014546, it says number is not valid. 14546 is the IVRS Number which should work without adding any prefix or suffix. How to get UID recipient no ?? UID Recipient Number will be provided very soon by your Operator or Network through SMS or Call. Every Operator will send the UID Numbers very soon, maybe through SMS or Call. No, you misunderstood. When we got our Aadhaar card, we might have registered mobile number to it. This means Aadhaar card has mobile number linked. Now, currently as per Government, you have to link Aadhaar Card with all the Mobile Numbers you have. This is not Mobile Number Link to Aadhaar card, it’s Mobile Reverification i.e., Link Aadhaar Card with Mobile Number. 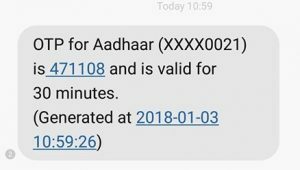 I have been trying to link aadhar from nearly 1 month. After entering OTP a message ‘cannot process request due to some technical issues. Try later’ is getting. What can I do to complete this?? Which operator and circle are you trying in?